Unbridled exploitation of workers under the supervision of BJP governments has led to widespread anger and discontent, which is likely to be reflected in the Assembly polls. While Madhya Pradesh and Rajasthan are gearing up for Assembly elections, the two BJP-ruled states have also been at the forefront of actively overseeing the worsening condition of industrial workers. Besides administering meagre rates of minimum wage, the two states have introduced a slew of changes in their labour laws, leaving workers unprotected and making their livelihoods more insecure than ever — in the name of promoting ‘ease of doing business’. The minimum wage rate in Rajasthan is among the lowest in the country. 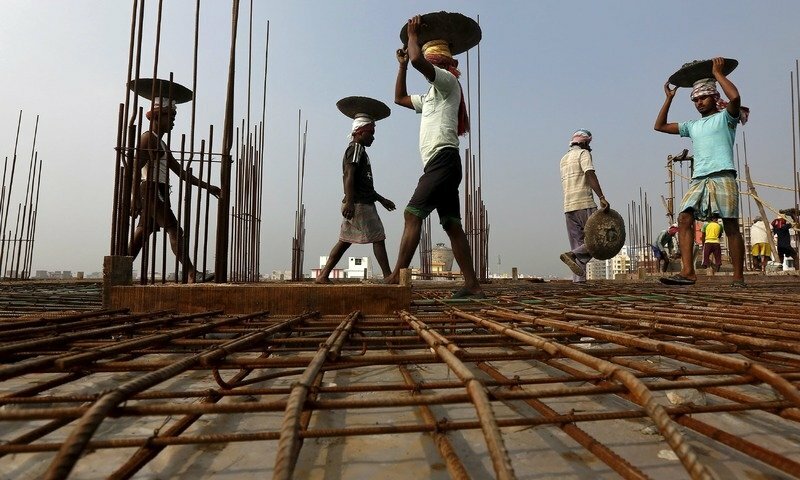 As per the latest notification in 2018, the minimum monthly wage rate is Rs 5,538 for ‘unskilled’ workers, Rs 5,798 for ‘semi-skilled’ workers, Rs 6,058 for ‘skilled’ workers and Rs 7,358 for ‘highly skilled’ workers. Madhya Pradesh is only slightly better in terms of minimum wage. As per the latest notification in 2018, the minimum monthly wage rate is Rs 7,375 for ‘unskilled’ workers, Rs 8,232 for ‘semi-skilled’ workers, Rs 9,610 for ‘skilled’ workers, and Rs 10,910 for ‘highly skilled’ workers. Trade unions for years have been demanding a minimum monthly wage rate of Rs 18,000 — indeed, Central government employees get a minimum wage of Rs 18,000. As for labour laws, Chief Minister Vasundhara Raje in Rajasthan has taken the lead in 2014 in codifying the kind of insecurity for workers that Prime Minister Narendra Modi wants to introduce at the national level. And Madhya Pradesh, ruled by Shivraj Singh Chouhan, for nearly 14 years, has followed. In 2014, Raje amended the Industrial Disputes Act 1947, at the state level — given that labour laws are on the concurrent list — so that industrial establishments with less than 300 workers do not need to seek permission from the state government to retrench or lay off workers, and even to close down the unit. Earlier, the threshold of minimum workers for doing the same was 100. To understand the significance of this amendment, one needs to note that 93% of factories in India employ less than 300 workers. As for Rajasthan, only around 256 of the state’s 13,256 factories have more than 300 workers, as has been pointed out by several trade unions. This means that such factories can ‘hire and fire’ workers at any point, as smaller establishments are wont to do to cut costs and maximise profits, meaning zero job security for the workers. It is meaningless then that the new rules require the employers to pay a higher compensation to retrenched workers, meant to only sweeten the blow. On the other side, Rajasthan has made it more difficult for workers to collectively bargain for their rights through trade unions. In another amendment to the Industrial Disputes Act 1947, Rajasthan increased threshold membership of a trade union for it to be recognised and registered from 15% to 30% workers at a unit. Rajasthan also made amendments in the Factories Act, 1948. To begin with, in order for the Factories Act to apply, the minimum number of workers has been increased from 10 to 20 in case of factories working with the aid of power, and from 20 to 40 workers for factories working without the aid of power. This means that more workers will be deprived of the benefits that the Act mandates, such as proper drainage system, ventilation, water facilities, cleanliness, healthcare provisions, etc. Moreover, for a court to take cognizance of any offence under this Act, the BJP government has made it mandatory to obtain a previous sanction in writing by the state government, along with complaint by an inspector. Similarly, an amendment in the Contract Labour (Regulation & Abolition) Act 1970 has increased the minimum number of workers in an establishment or with a contractor from 20 to 50 for the Act to apply. Meanwhile, Rajasthan has allowed up to 49 workers at a unit to be employed through unlicensed contractors. Even though existing laws mandate the same rights and benefits to contract workers as those of regular workers (such as wages, social security, and even use of facilities like canteen and bathroom, etc. ), by using unlicensed contractors, the principal employers can easily evade their responsibilities to the workers. Between 2014 and 2015, Madhya Pradesh — ruled by Shivraj Singh Chouhan for almost 14 years — followed in the footsteps of Rajasthan, and made up for the delay by introducing an even higher number of changes in the labour laws. MP amended the Industrial Disputes Act 1947, just like Rajasthan, increasing the threshold number of workers from 100 to 300 in an establishment as “pre-condition of permission from the Appropriate Government, notices, compensation for lay-off, retrenchment, closure”. MP also increased the compensation for retrenched workers. The BJP government in MP also amended the Factories Act 1948 to increase overtime hours for workers and to bring in night shifts for women workers. Another amendment in the Trade Unions Act allows the government to dispose of an application for the registration of a trade union within a period of 15 days to four months. “While this may look like a reasonable provision, in practice it is a bureaucratic weapon to dismiss the application for registration of a new trade union since often various procedural obstructions are put up when an application is received and workers need some time to comply with all these,” as NewsClick has pointed out earlier. Another amendment to the Madhya Pradesh Industrial Employment (Standing Orders) Act 1961 allows employers of small and medium enterprises (SMEs) with less than 50 workers to terminate any employee without giving any reason or needing to conduct any inquiry. Even as the Modi government has been trying to merge 44 labour laws into four Labour Codes — meant basically to destroy all protection to labour across the country and make things easier for private businesses — and has been facing parliamentary constraints along with massive resistance from trade unions, the BJP-ruled states have gone ahead and cleared the aisle as much as they could. The BJP-led National Democratic Alliance government has already introduced fixed-term employment in March, which deals a major blow to workers’ job security, as it allows all private businesses to hire workers for short-term contract basis and fire them whenever they want. As these two States head for the Assembly polls in the coming weeks, the growing attack on workers’ rights by BJP-run governments to please their corporate friends, may resonate with the an already disenchanted and angry electorate.